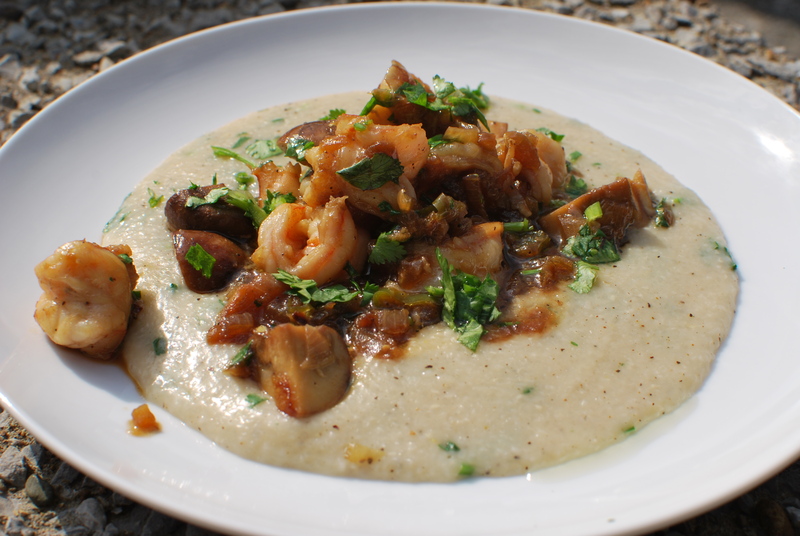 It’s a little embarrassing that I didn’t even know what shrimp n’ grits was until a few years ago. Being from the South, I somehow never ate this dish in my childhood. Although the dish is quite popular in the low country and Georgia, I guess it was never a Nashville thing. Now, grits on the other hand – you bet I know about grits. Had those ALL the time – with pork chops n’ gravy or with sausage and bacon for breakfast. Anyway, I stumbled upon this dish when I was visiting my good friend, Ehson, in Atlanta. We went to grab lunch at this restaurant around his apartment. Sadly, I have absolutely no idea what the name of that place was (so, if you are reading, Ehson, and you remember, please let us know!) I saw shrimp and grits on the menu and I thought it was particularly interesting – a combination I had never seen before. But I was craving some grits – and this dish had PEPPERJACK CHEESE GRITS. Pepperjack cheese is my favorite of all processed cheeses (I know, guilty pleasure) and so I got it. That was a life changing experience. 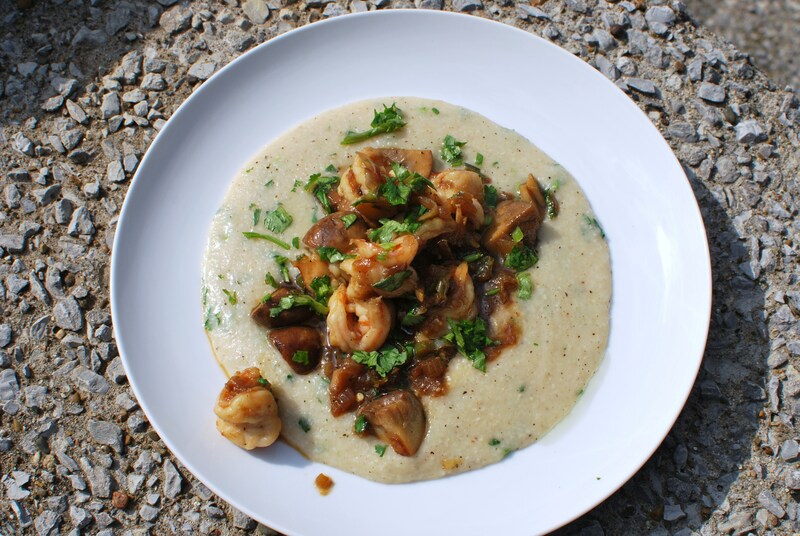 Now, I make shrimp n’ grits ALL the time and in many different ways. Well, I make the shrimp in different ways – sometimes sauteed with mushrooms and bacon, like it is here; sometimes rubbed with flavorful spices and grilled; and of course cooked with peppers and a chicken gravy for a hearty version. The grits, however, never change. It’s always pepperjack cheese grits. I wouldn’t have it any other way. First, get the bacon in a pan and cook it over medium low heat so all the fat renders out and the bacon is crispy. Add the onions, jalapeno, and garlic and season with salt. Turn the heat to medium and let the vegetables cook until the onions are caramelized, about 10-15 minutes. Then add the tomato and cook until the vegetable mixture has almost turned into a paste. Mash the tomato pieces with a wooden spoon to break them up. Throw in the mushrooms and let cook for about 8 minutes until they are golden brown. Add the shrimp and season again with salt and pepper. Coat the shrimp in the vegetables to give it lots of flavor and let them cook. Once they turn pink, they are done, about 5-6 minutes. Sprinkle in the chives and a squeeze of lemon juice. Taste the shrimp and season with more salt and pepper if necessary. Put the cold milk in a pot over medium heat. Lay in the thyme, garlic, and a few cranks of black pepper in order to infuse the milk with great flavor. Once the mixture comes to a boil, after 5-6 minutes, remove the thyme and garlic and stream in the grits, constantly whisking. Season with salt and cook the grits for about 20-25 minutes until they are done. Add the butter and pepperjack cheese and whisk to incorporate. Let all the cheese melt. Taste the grits – if they are seasoned well with salt, simply add pepper. If it needs salt, add some along with a few cranks of black pepper. Keep the grits over a very low flame so they are nice and creamy. If the grits begin to set, simply add some more milk and whisk them until they are at the proper consistency. You want your grits to be a little runny and not so stiff on the plate, so add a splash of milk and incorporate it before serving. Throw in the fresh chives at the end. Spoon a good amount of grits on your plate and pile it high with the shrimp. Now that’s some good eatin’! ← MEATLESS MONDAY: Homemade Tater Tots! My comment to this and the homemade tator tots is – When are you going to cook for use Nashville Food Bloggers? I want one of your tots! I want some of those grits! Yum! I think I was there at that restaurant with you, didn’t we have this really elegant Southern belle waitress? And they gave us simple syrup for our iced tea? And the specials were on this little chalkboard that this dude talked about for 5 minutes. Awesome restaurant, if I remember right. Yeah! I think you were there – that’s the place! But what was it called…. Yeah I can’t remember the name… I do remember Casey ironing a polo though. We tinkered with it a little bit, but stuck to the basics. It was delicious!!! (x100) Best dinner we had all week. Thanks for the idea, and great recipe. We’re going to try to remake it, with our own twist and then we’ll put our version up. But I would definitely reorder this in a restaurant! Glad you enjoyed it! Would love to hear what your tweaks were!